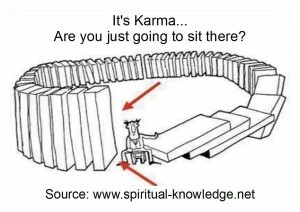 Heal Your Puzzle » Blog Archive » What is Karma? Karma describes a fundamental concept in Hindu and Buddhist traditions that “the sum of a person’s actions in this and previous states of existence decides their fate in future existences”. Familiar expressions based on this are: ‘what goes around comes around’, ‘paying off karmic debt’, ‘come full circle’, ‘reap what one sows’ – all referring to this running total of our past actions and how it affects our present. 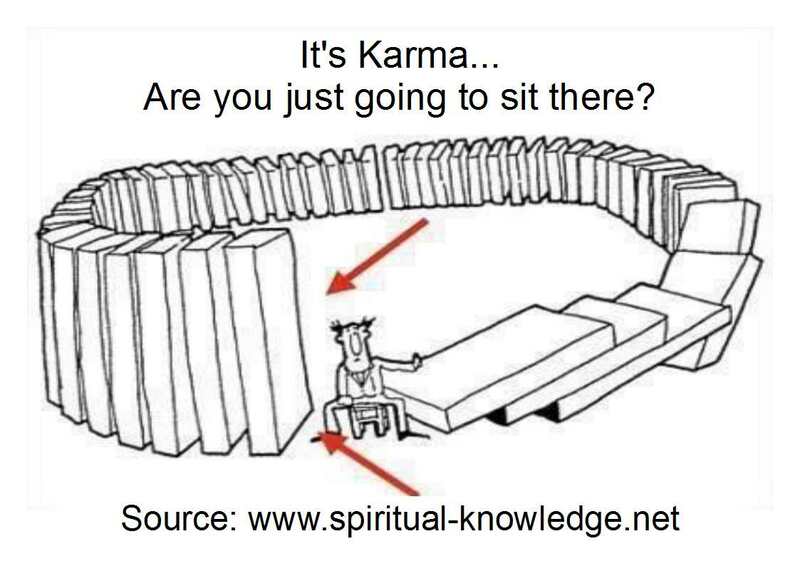 The word ‘Karma’ originates from an ancient Sanskrit word ‘karman‘ meaning ‘action, effect, fate‘ and so, in more detail, the theory is that with a deliberate ‘action‘ (or even deliberate inaction), an ‘effect‘ (or consequence) was caused, which created an unavoidable event in the future (fate) as payback for your original intent. This has lead to the view that if you build up ‘bad karma’, something ‘bad’ will happen to you in the future as punishment and vice versa with ‘good karma’ bringing rewards. From a Healing Perspective… Whether you call it Karma or not, we all have our own personal database of who we are and how we perceive the World. Some of it is inherited, some may be from past lives if you believe in reincarnation, some is what you have learnt, experienced and created in your life to date. All this information, “…the sum of your actions…” and more, is held in your subtle energy field. Alongside each action will also be recorded your whole perception of that experience:- who was involved, why, how, how you felt, how they felt, etc. and when all brought together will create a form of behaviour, a response, an ‘action and reaction’ for you when in similar situations in the future. The more an experience is repeated, the more actions and associated information will be stored and the resulting behaviour pattern will become more innate and deeply embedded. Fate feels like fate because you have been here before, it is familiar, it is an old experience (successive old experiences) reappearing in your life for you either to repeat, to support you, or to challenge you to grow beyond it and create something new. Karma does not decide your fate, your choices do. Exercise your Will – ask yourself what circumstances (experiences) you want to move on from or change? …Are you going to stay sat on that stool waiting? Are you going to hold the last domino up forever? Are you going to get up now and reassess your situation? Could you build all the dominoes into something useful and fulfilling for your life? It really is up to you.